Hey guys! Sorry for the long wait but as time passed by and I reflected even more on myself and the trip, God revealed more and more things to me and I’m blessed to be able to finally share it with you all!! As Francesca mentioned in her post, our team hosted a Japan Tea and Sharing Night to share a little more about the trip. One event we did was a sort of “passing the baton” activity where members of previous teams would give us each a word of encouragement that they received while praying for us. Serena told me that at first, she had the word “MIGHT”, but instead gave me the word “MIGHTY”. She encouraged me to not be unsure and hesitant about doing things, but be more bold to do what God calls and wants me to do and to walk more boldly with the Holy Spirit. I thought it was crazy because everything she said was what I was going through and what I have been praying for. So, going into the trip and throughout it, I kept that word in my mind. The trip provided a diverse range of ways to serve and love on the people of Japan. I got to lead bible studies, share my testimony, dance with people, talk with random students in a cafeteria, and do 1-on-1’s with students. It amazed me just how differently I would be used and how different parts of me would come out to help serve and lead. Being a introverted and quiet person, I wondered how I would be able to talk to people for hours and have eyes on me everyday. I needed my alone time to recover and gather myself. However, I found myself enjoying spending time with people and speaking up a little more than I thought. I wasn’t as tired as I thought I would be while spending several hours talking to different students (I still felt super tired at the end of each day though). During that time, I continually remembered the word “MIGHTY” and wanted to just follow what God was telling me to do, and what he wanted me to do was love on the people there because He loves them SO SO much. He wanted me to love out of the overflow of His love for me and pour out His love to everyone I met. That allowed me to step out of my comfort zone more and engage in conversations without burning out as much. Another thing that amazed me was how I began to partner with the Holy Spirit and really listen to His voice. Through that, I was able to receive words and images from the Holy Spirit to give to people to encourage them. A lot of times, I was very skeptical about it and whether it really is God or just me, but it surprised me how some of the words I had for people were spot on to what they were going through and how others had the same words for them too. As the trip went on, I really began walking more boldly in the Spirit just like how Serena told me, and it’s still crazy how God spoke through me in those moments when I had no words or thoughts. I learned to trust Him to give me the words to say to people and to pray when I wasn’t sure what to pray for. One thing that surprised me was just how often we had to dance!! Beijo and I put together a few moves simple enough so that everyone could watch and follow along. I expected to do it maybe a few times during the trip and not ALMOST EVERY SINGLE DAY!! Even though it was tiring, it was so worth it. Seeing everyone, little elementary school kids, college kids, and even adults dance and not care what they looked like and have genuine fun doing it was a HUGE blessing to witness and be apart of. It really brought people out of their shells and helped them open up a little and have unhindered joy. 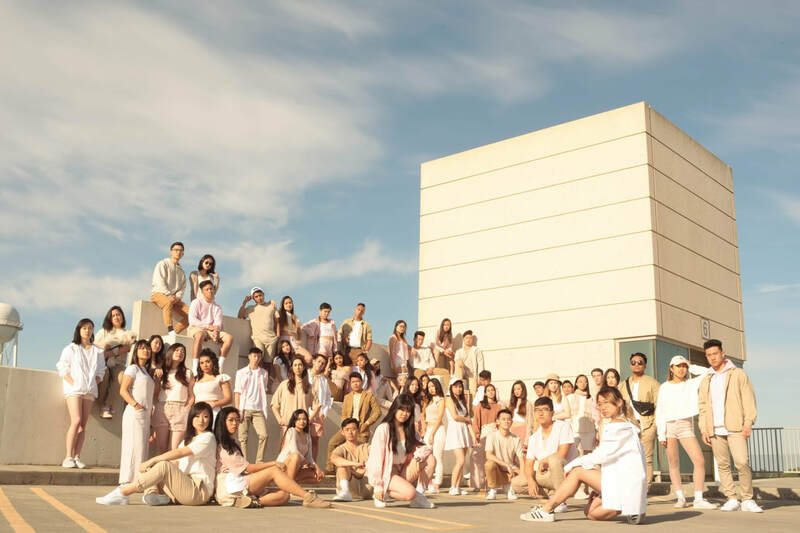 Since I am a director for Agape, a Christian-based dance team, I was able to see what dance does and how God can pour out his love through it and how we can worship him with simple movements of our bodies. One of the more admirable things I witnessed was after meeting with some Japanese Christians, I realized just how powerful and solid their faith is. Every single one I met had this burning desire to learn more and to try to share their faith with friends or family even if they were still new to it. I couldn’t see a hint of lukewarmness in them and wanted to know why. I found that because of the huge sacrifices that they make for their faith and the hardships they go through because there are so few Christians in Japan, their faith grows so much stronger and allows them to get that much closer to God. Around them there are barely any Christians, so they have that much more reason to go straight to the source in God and develop a much more intimate relationship. I truly admired that aspect and want to strive to have a courageous heart like them. After a LONG time of reflection (once again sorry haha), I feel like God has done so much during our time there not just in Japan, the people we met, and our team, but also with my life. The first thing I came back with was a heart for Japan. Spending 3 weeks there and encountering people of different ages and backgrounds allowed me to see that although we are different culturally and in other ways, we are all the same in that we need the Father’s love. We need someone to fill the hole in our hearts that nothing and no one else can fill. Just like me, they are DEEPLY LOVED by God and being able to show that love to them is nothing like I have experienced before. Through my interactions with the little kids in Utsonomiya and Nozomi that we ran around and learned English with to the college students in Tokyo struggling with finals to the students in Shimane who wanted deeper relationships and answers to their questions about faith and to even all the missionaries who devote their time, money, and energy to serving the people there, I began to see them the way God saw them. As children. HIS children. Sons and daughters that haven’t fully experienced His love and desperately need it. As the trip went on, I fell more in love with the people and country and wanted to pour out more into them even though I was drained of energy. Coming back home, I wanted to go back the next year and see growth and change in the people I connected with. I want to see how Kousei, Masaki, and others in Tokyo are doing in their walks, how Nozomi Sunrise and Utsonomiya Glory Church is growing, how Chi Alpha is extending to other campuses and reaching even more students, how Scott and Carmella are having to create new programs to fit all the students interested in their Florida programs and Bible Club, and how all the students and friends in Shimane are growing in their curiosity of Christianity and as young men and women. All of these interactions and conversations changed something in me. God used every little thing to change my heart to love and see all of them the way He does. I remember Preston telling our team that our mission is a success if we return home with even more of a heart for the people of Japan. There is little I can do to create change, but one thing I can do is pray here in the US for God to encounter everyone there and just to bring that wave of love and grace and crash into their lives. Through the use of Facebook and Line, I can keep in contact with them and continue to develop our relationships. I pray for more intentionality and to continue to deepen my love for the people I met there. After a few weeks of being home, I realized that God did more than just give me a heart for Japan. He also softened my heart to have more of a heart for people in general. I think God gave me new eyes to see the people around me the way He sees them and not in the sometimes judgemental and skeptical way I did. I felt this the most when I staffed a High School retreat at my home church in SoCal. The same students that I saw as troublemakers or annoying became students that I saw as my younger brothers and sisters that are loved by God, just like the students I met in Japan. Although they still got on my nerves, I was able to see just a glimpse of the love that God had for them and how precious they were in His eyes. 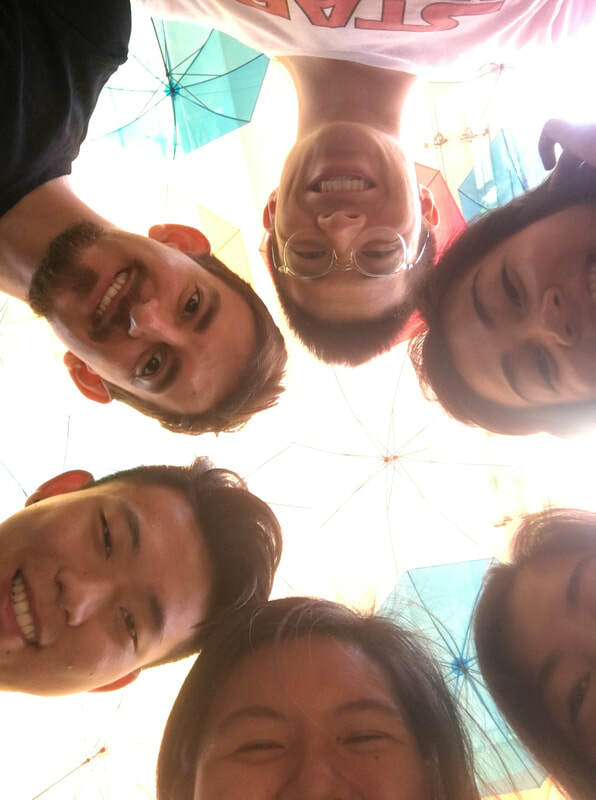 Even with Agape, I started to have a deeper love for the team and the members, especially my co-directors, because I began to understand on a deeper level just how special and important this team and community is. My team members are no longer just friends on a dance team, but people that God loves dearly and wants to have a personal encounter and relationship with. Just like in Japan, I want to develop relationships with them and share God’s love with them through my actions and words. I went on this trip because I saw an opportunity to do ministry and decided to take it. I thought that I would just be giving my time, energy, and knowledge to love on the people there. Coming back, I realized that I received so much more than I gave away. I gave three weeks of my summer and received more clarity about my future and a heart to serve. I gave my blood, sweat, and tears to serve the people there and received a love unique from any other love I’ve received. I gave my testimony and knowledge of the Gospel and received a deeper understanding and perspective of the Father’s love. Thank you to everyone who supported me financially and prayerfully!! It was such an amazing blessing to have served there and I would love to share more stories about it, so HIT ME UP!!! "Preston, would you lead the trip to Japan this summer?" Would I, should I, or could I? Did I have the leadership, the determination, or the calling to give it a try? The churches would love to have us back in their preschools. God's heart yearns for the 99% of this nation. God made this nation fertile for deep, intimate relationships. I missed presenting students with pondering questions about our Creator. We had to come back. I felt called to build and empower a team of DCF students here. Winter came. Preparation had begun. Fourth, scheduled fundraising days and encouraged our team in their fears and doubts. 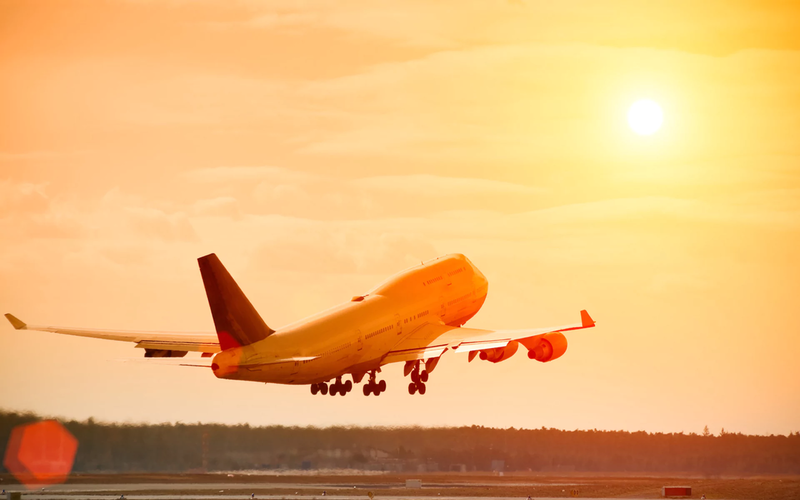 Fifth, scheduled talks with the missionaries and bought the flights. Sixth, scheduled additional assignments and sent out a packing list. Seventh, scheduled newsletters and prayed constantly. Spring ended. Japan here we come. Our petitions in prayer: God use me on this trip and please make this worthwhile. We received a relieving welcome from a tall, lanky man named Shane. All while breathing in the warmness of home as I entered. ​Each member gave their own form of grit. No, I want just you two to do it. Ryan and Beijo, lead tonight's XA Live gathering with a dance! Lead it together first, then teach the dance to everyone as they glance. Beijo, can you share your testimony at the Gospel Night? I know you need help - let's go over it tonight. You came to the faith merely 2 years ago - a beautiful story to share. I know you will bring passion and fire into the air! Susanna, can you sing "How Great Is Our God" in Japanese? I think it'll feel like a breeze. But God is using you mightily in all the talents that you're bringing! Francesca, can you share a message for the outreach event? It's okay to spend a lot of hours preparing - feel free to vent! You have a powerful voice and a story that needs to be shared! God knows you well and there's nothing that should be spared. ​God is using your Spanish overseas! Would you draw something for the missionaries as a thank you for everything? talking to students with Christ's love together. Feeling His Spirit working in each of them. As they bravely share their insecurities in these safe spaces. God spoke to them individually and used them powerfully in their leadership. Deep friendships forged and God made known a little more here forever. This team did over and above any of my expectations that I could have held ever. God's heart for Japan that now resides in Ryan, Beijo, Susanna, Francesca, David, and me. May God continue to deepen our hearts for Japan within each other. May He form in us something so deep that will forever burn. and thankfulness that God could even use us powerfully there. And may God continue to use us beyond this trip in our lives, in our communities, in our friendships, and in our families. 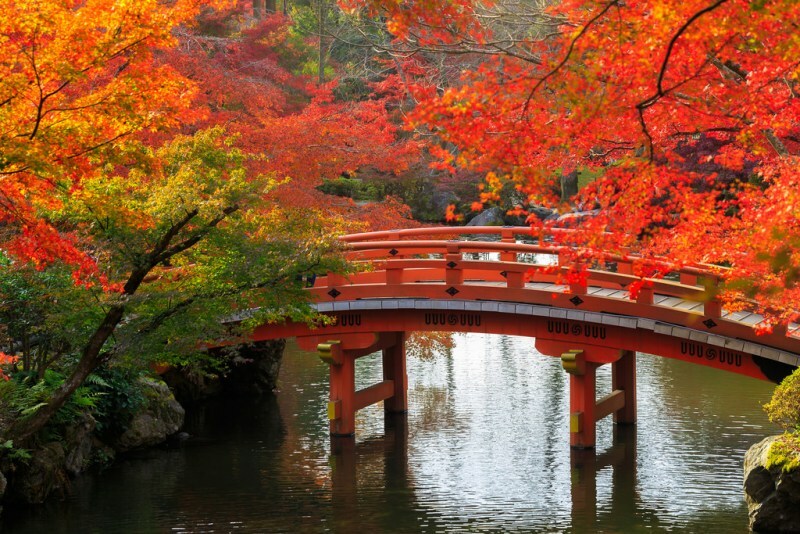 May God use Japan as a reminder of the beauty of what he can do, has done, and will do in us and through us forever and ever. Hi Everyone!! It has been a while since I write a post and this past month has given me a lot of time to process. From the beginning when it was announced that DCF was going to Japan, I had a curiosity to go and experience Japan. As time past and our schedules developed, my heart for Japan also developed. I remember going out to eat at Yakitori Yuchan and watching Your Name to start getting a taste, if you will, of Japanese culture. But nothing could have fully prepared me for the amazing experiences that I got to share not only with Japanese students but also with the incredible team that was with me through it all. Earlier this year in March, I went on missions to Mexico also with DCF and experienced the love of God in a way I had never experienced before. I was born in Mexico but serving the Japanese children and students was not much different than serving the Mexican children, but obviously language was not a barrier then. I learned that children both Japanese and Mexican can be very timid at first, but when I played like a child myself and just had fun with them, they held nothing back and loved on us all. In Japan, I was even called Mario and Messi!!! Looking back, I can see why people say that God’s love is a fatherly love. We are His children, and He wants nothing more than to love on us and have us hold nothing back either. Going in, I felt very unfit for the trip. I knew no Japanese, had little knowledge of Japan itself, didn’t have a strong inclination to Japanese food, and looked the least Japanese from the team! What could I possibly bring to the team???!! However, I came to realize that I had more to offer than I thought. It was highlighted to me that every aspect of myself was utilized in one way or another. My art skills, love of bugs, running, cycling, even my Spanish!!! Yes!! I actually used Spanish to help translate a little Portuguese, granted Susanna also spoke Japanese so she was there on the scene (X haha My point is that even without the “qualifications” God still had a personally-crafted plan for each of us, all I had to do was desire to help and hand Jesus the wheel. Every day in Japan was full of seeking and finding. Seeking opportunities to show others the love of Jesus and finding out for ourselves that we ARE the love of Jesus and through Jesus working in us we share that love. Among the many great friends that I made are some of the hardest working people I have come to know. The Chi Alfa Japan staff and Scott and Carmela showed me that sometimes you have to sow the seeds in hope that others will continue to water and care for it and if God wills it you too will reap the rewards. I definitely felt like a sower those three weeks in Japan, but also like a seed that had been watered with new a refreshing water. As I continue my stay in Davis I will keep in mind that even in my “disqualifications” I am important in God’s plans to bring others to Christ, in my own special kind of way. I don’t feel like going to Japan has fixed my past problems or mistakes, but it did strengthen in me something just as powerful: an everlasting desire to help and love on others. Going back to Davis knowing what I know and feeling what I feel, I can only imagine what God has in store. Thank you to all my supporters for watching, listening, reading, and praying. Without you our trip would have remained a dream and please own this trip and harvest as it is as much yours as it was ours. Hi everyone! Thanks for being patient with us as we process and reflect on our missions trip! 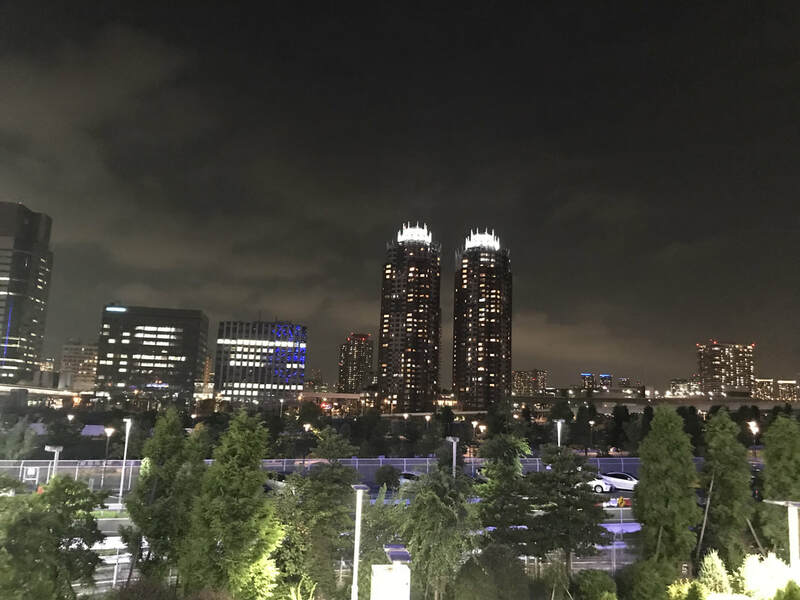 Here's a few thoughts that came up from my debriefing of our time in Japan! 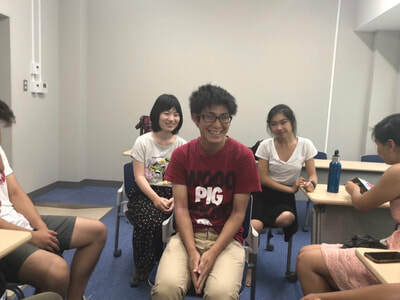 Last April, our team hosted a Japan Tea Sharing Night where members from last year's Japan team got to share their highlights and testimonies of their time in Japan. Some members of DCF joined us in support to enjoy stories and sweet memories of last summer in Japan. As we drank some tea and had some small Japanese treats, we listened to each member share of the joys and victories and at the end of the night, the 2017 team surprised us by sharing words of encouragement they had received in prayer and wanted to bless us with! My "encouragement-giver" (haha) was my friend, Christina Huang. She had prayed for me and she felt the Lord declare the word "refresh" over my experience in Japan. She believed that this trip would be something to refresh my soul, something to remind me of the Lord's goodness in my life. She shared her prayers for a replenishing of joy and reminder of rest and I happily received them. After an academically and emotionally difficult junior year, her words were affirmation of the prayers I had lifted up to the Lord: prayers of rest, restoration, and renewal over my season with God. She put words to the longing of a spiritual refreshment that I had had in my heart for a long time and it only made me more excited to go on this Japan adventure with Jesus! Looking back, I think it's funny that I got the word "refresh" because I think about our time in Japan was (physically) anything but restful. I described in a previous blogpost of our long hours and packed schedules. And man, it was tough to always be on the move and not have much time to take a moment to recuperate! As someone who really enjoys their alone time and finds rest in getting in touch with herself, my biggest challenge was finding that "Francesca time" to regroup and re-energize in the midst of our back-to-back ministry time. Back in Davis, I'm used to being able to have control over my own schedule and I've learned over the years how to prioritize rest in order to operate at my full capacity in school, work, and ministry. Without that routine, I noticed myself really struggling to stay present and connected during our team especially at the end of the night during debrief time. 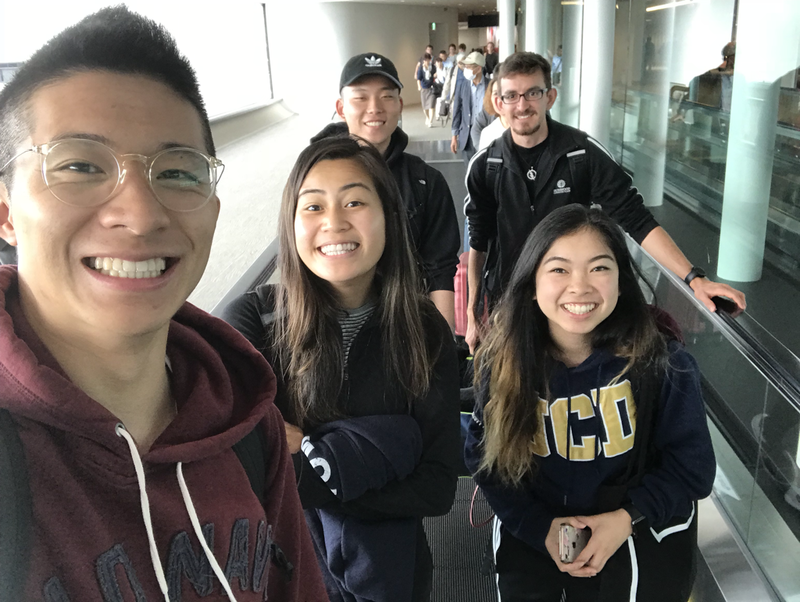 But, believing that Japan would be refreshing just as Christina had described and knowing that the Lord's grace covered our missions trip encouraged me to allow Jesus to show me how to emotionally and mentally rest even when I'm physically drained! Take a deep breath and pray. On day 9 of our trip, I remember feeling especially tired getting up in the morning. We had a big day of prayer, fellowship, and outreach head of us. 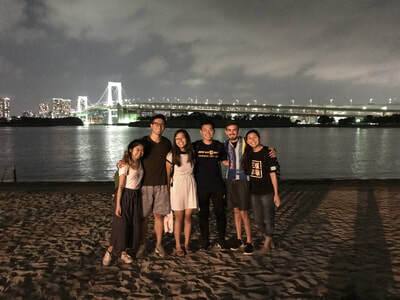 And I could see our team looking forward to having prayer at Asakusa, a very popular Shinto shrine, meeting new students at different universities, and helping lead bible study with Chi Alpha staff and students. And to be honest with all of you, I did not feel up to the task that Wednesday morning. 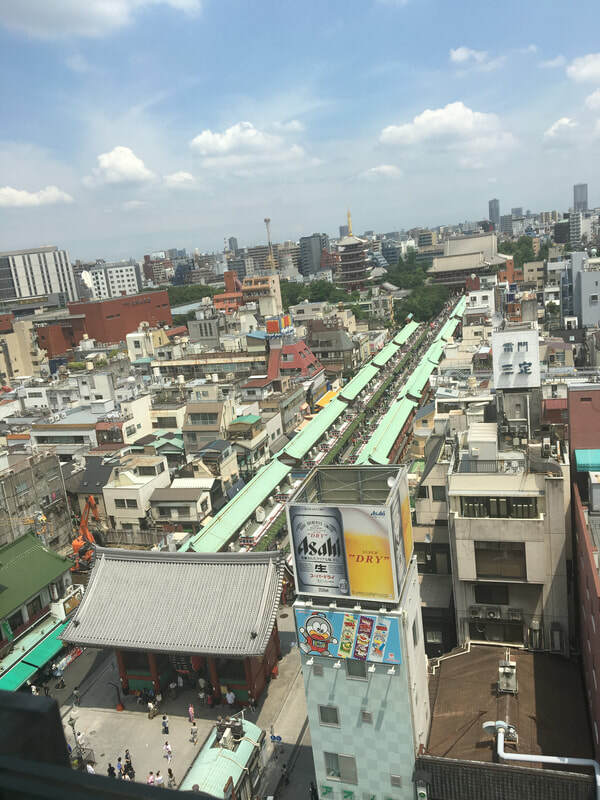 I had talked to a few of the Chi Alpha interns the night before about visiting Asakusa and I felt the nerves starting to bubbling in me as I listened to their experiences at the shrine. They had described the current spiritual climate of Japan and specifically the warfare happening within the walls of Asakusa. The tiredness from the week and my nervousness from the night was hitting me that Wednesday morning. I was overwhelmed, drained, and really needing my space to breathe... While the team was connecting and sharing insights from the day before, I spent the 30 minute train ride trying to get myself together and calm down the emotions and thoughts flowing in and out of my heart. 15 minutes into the train ride, I felt lost in my pool of emotions and longing for a moment alone in my room back in Davis. I felt panicked knowing time was running out and this was my only time to gather myself... But, it was in this moment where I felt Holy Spirit gently reminding me to pray. Pray over the exhaustion from the long week. Pray over this longing for solitude. Pray over the anxiety for Asakusa. Just take a deep breath and pray. ​I've never felt those words ring so true before this moment. The Lord refreshed my soul just like He promised He would to David in the Psalms. The Lord refreshed my soul just like He told Christina He would in her prayer for me. He refreshed my soul on this Japanese train car just like He would continue to do for the rest of the missions trip. From drained to filled. From anxiety to peace. From lonely to known. Jesus met me with His presence and ushered the peace, love, and comfort that only He can bring as the refreshment of my soul. Thank you so much for reading & supporting our trip! I chose to highlight just one of the many, many wonderful ways Jesus met me on this trip, but there are sooo many more! I would love to share with all of you, so feel free to ask about my stories with the people, places, and powerful moments with God! ​Hi everyone! 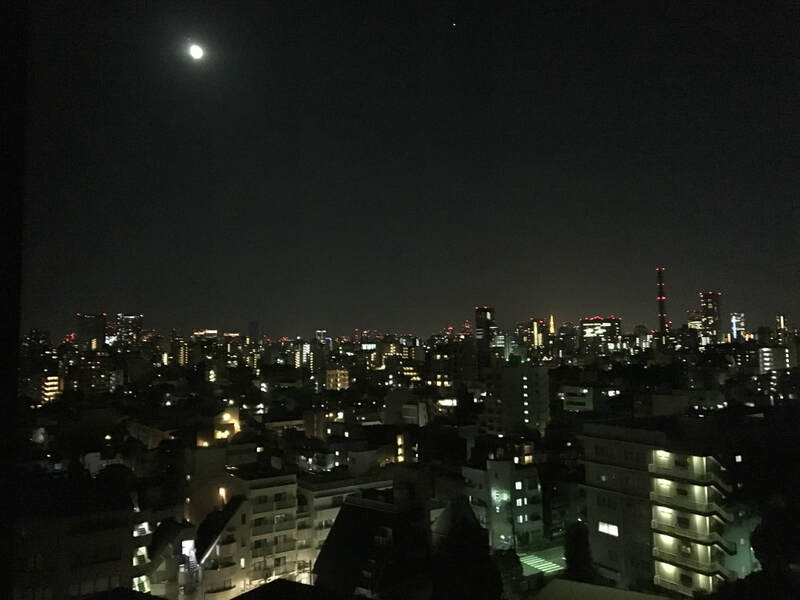 It’s been a while since I last posted here  About a month ago, I came back from Japan and have been reflecting on what happened over the three weeks I was there. I miss the people very much and have brought back many precious memories and lessons God has taught me. My parents grew up in Japan and they taught me how to speak the language, so Japan has always had a special place in my heart. Knowing that the Japanese Christian population is less than 1% stirred in me the desire to one day go and do something, and DCF gave me this opportunity to do so. Living amongst the Japanese people truly opened my eyes to the painfully sad truth- that all these people are living in such darkness and loneliness without God. What was also challenging was standing in the midst of thousands of people walking past me feeling so helpless because I wanted to reach out and love on every single one of them but knew it physically wasn’t possible. BUT! The connections that I’ve been able to make at XA Live, the churches outside of Tokyo, and at Shimane University have been so special and it’s been so great being able to keep in contact with them via LINE (which is basically like FB messenger but with cuter stickers!). Ever since last December, God has been teaching me the importance of loving people and showing others His love through us, and I felt Him highlighting that during this trip as well. 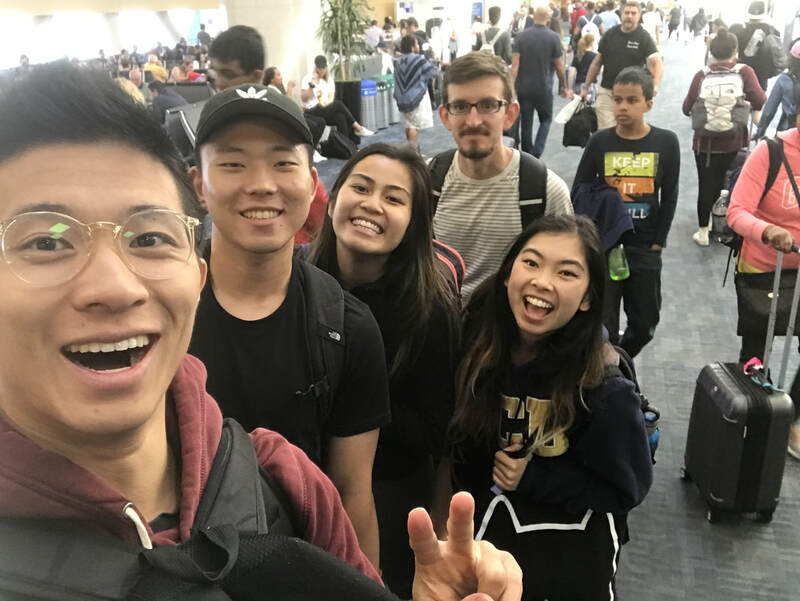 Just the fact that students from Davis were able to make connections with people thousands of miles away still boggles my mind. Everyone comes from such different backgrounds and beliefs but every person we interacted with is a precious son or daughter of God that we couldn’t help but love on! And through interactions I had with people, God also taught me the importance of me just being me! In a world that’s full of competition and comparison, it’s extremely easy to want to be or act a certain way, but God has made each person uniquely with their own personality and gifts so that they can use them to glorify Him in ways that only they can! The way I loved on, interacted with, and cared for the students looked different than the way that Preston, Beijo, David, Francesca, and Ryan did. But when we came together as believers to just love on all the people around us, I learned that God can do crazy powerful stuff through us and His love can reach so many. The people in Japan are so ready to experience God’s love and are hungry for Him, whether they know it or not.When we love ourselves and see ourselves the way God sees us, we’re able to share His love to everyone around us! During this trip, God taught me that He works in ways that to Him make perfect sense but may be extremely unexpected for us. 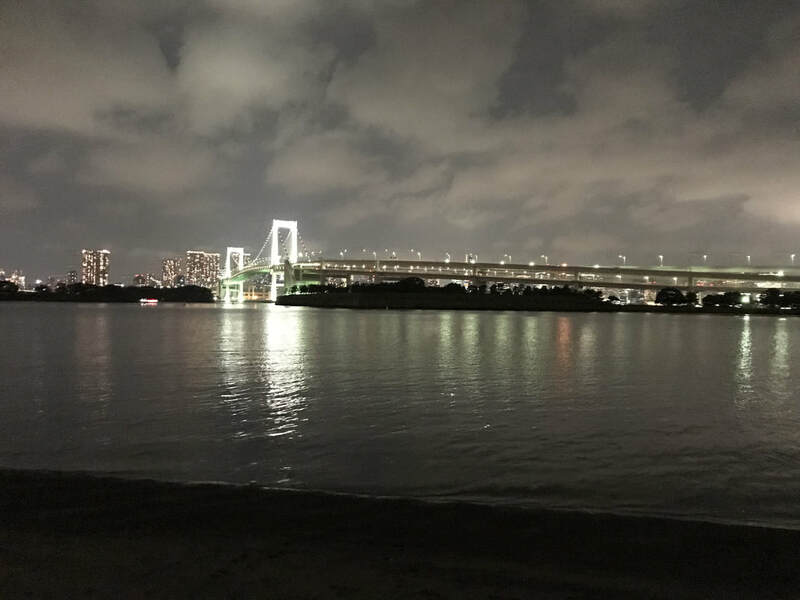 Things on this trip were very different than what I was expecting- I was a bit surprised at our schedule as going to different campuses each day in Tokyo and doing outreach on the campuses was a lot harder than I thought. But just because the results weren’t the same as what I was expecting doesn’t mean that I failed- it just means that God has other ways of using me and my teammates! This trip taught me that even though I can’t see the reason for things happening the way they did, God knows the reason. There are so many people we met who are whole-heartedly serving the Lord in Japan. Their hearts to serve the people around them is just so amazingly beautiful and inspiring. They all work so hard in their ministries and it was such a privilege and honor to work alongside them. They are all amazing people whom I love very much! <3 They’ve taught me and challenged me to really give God my all and put 100% into serving Him and glorifying Him, because He is worth it. Hi everyone!! I've been back in America for a few weeks now, and finally getting to process all that's gone through my head from Japan. Here's a few things that has changed and humbled me from this trip. Japan has moved my heart in a new way. A humbled way. 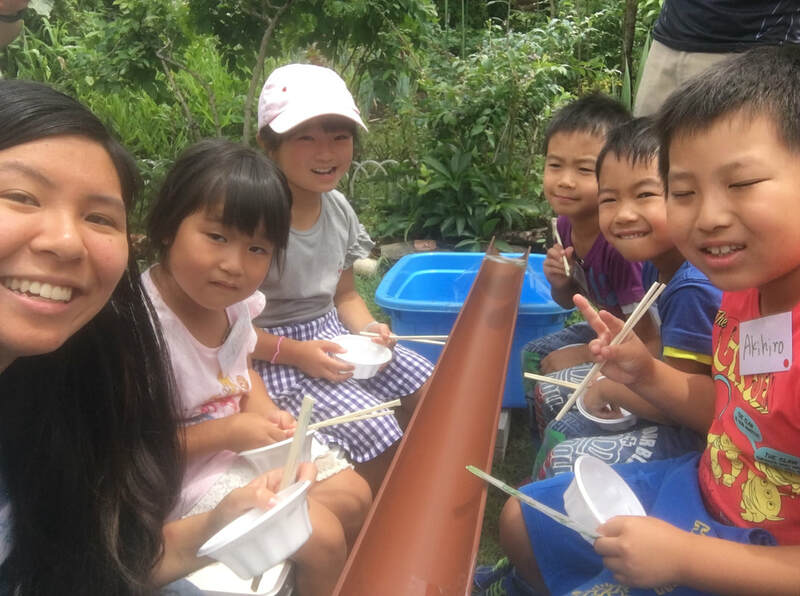 I initially wanted to come to Japan because I love traveling and learning about new cultures, but my heart was pulled in a different direction when I realized I wanted to come to love on people and to share my testimony. I love people. I love connections. I love having deep talks. I feel like everyone has that craving of connection with people and being loved. I didn't realized I needed it until I acknowledged it myself. I love talking about Jesus and what God's been doing in my life. I wouldn't be where I am today without the guidance and my faith in His goodness. I didn't know sharing about my faith could impact so many people around me, and that's why being able to share my testimony is so needed. It reminds me how blessed my life is every time, and I am encouraged to further the goodness of Jesus! "you can just be a good friend, but a great friend leads one another to walk with Jesus"
I am so encouraged to live a life to lift others up to their fullest potentials. I have always strived to love others. Especially after knowing how loved I am, I want others to be able to experience the unconditional love of God. 30 Love the Lord your God with all your heart and with all your soul and with all your mind and with all your strength. 31 The second is this: ‘Love your neighbor as yourself.’ There is no commandment greater than these. And...after this trip, I gained a heart for ministry!! I finally understand it. It's all about love and loving your neighbor because the world needs more of that. And if you don't do it, then who will? My heart can't even explain the excitement of knowing a person's life is forever touched by God's love. It's so beautiful. They get to live a life experiencing everything God has for them!! Arriving to Shimane, the next day the team got to attend Kazu's baptism!! What a treat we got. Kazu's testimony is sweet and simple showing God's goodness in his life! The DCF team met Kazu 2 years ago when he was still new to Christianity, and they poured love, kindness, and hope into him. Look at him now!! I get to witness the progression of students like Kazu! Wow! Lives don't change overnight, but knowing that God's plan is so good, we are here for such a divine purpose. I love Japanese children !! God has really opened up my eyes and mind about kids ministry. To be quite honest, I am not too fond of kids... and I was afraid that none of them would want to play with me. We did English camp at Utsunomiya Glory church/ played with pre-schoolers at Sonrise Nozomi Church. I ended up having an amazing time being with these little Japanese kids. It surprises me because they are so respectful and well behaved. They were the sweetest and cutest kids too!! Although there was a language barrier, that didn't stop them from wanting to have fun and interact with us. We bonded through dancing, playing tag, and making origami. Not much talking, but lots of laughter! I love being able to love on them. They are the most precious things life can offer. So pure, innocent, and full of joy. And that's how I want each one of these kids to live the rest of their lives! Knowing who our father is and being loved by him. I came here to love others but they loved me right back. 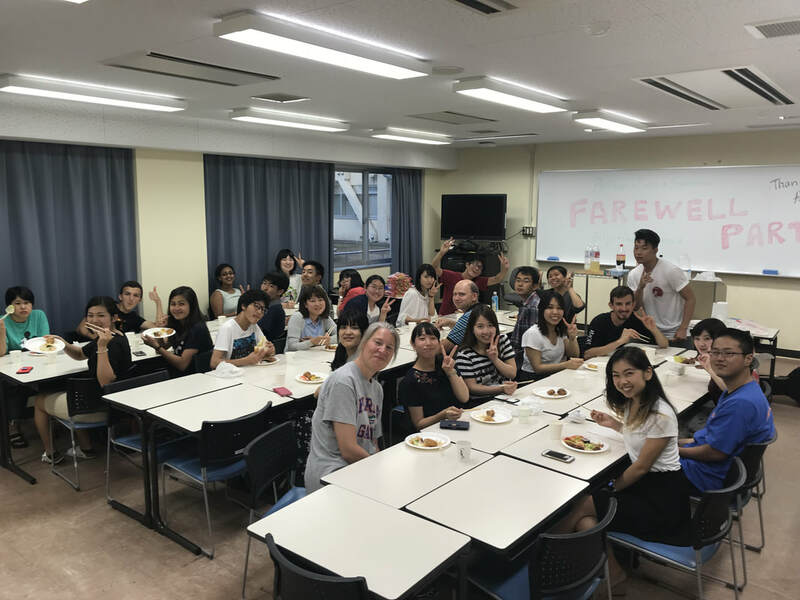 In my lifetime, I've served in so many different capacities, but I've never been loved back in the way that these students at Shimane University did. My goodness. This has been the most precious and fulfilling thing I have ever done. 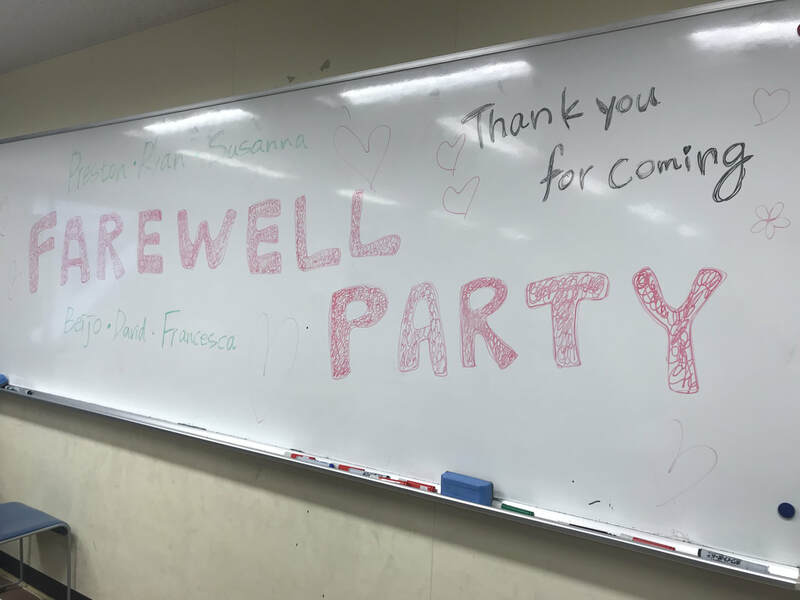 For us to be only here for 1 week... and the amount of students who showed up to the farewell party is more than I could imagine. And you can just tell that they were definitely impacted by our presence. All we did was love on them for a week and they received that love so well. The students hugged us, gave us gifts, and even prepared a song to sing to us. I've never felt so appreciated in my life. Some students were tearing up knowing that we had to leave so soon. I never expect to gain anything from serving others, however, the way they showed their gratitude towards us makes my heart so full. To know that they felt loved is all I needed to hear. Don't hesitate to follow up with me, I have so many great stories to share! ​Thank you for reading and following the blog, I hope you get to receive as much as our team did. Until next time! I will for sure come back to Japan one day!! Day 21: Mata Ne Japan!! * "Mata ne" meaning "see you again" in Japanese! Our time in Japan has flew by and it's sad to say goodbye. It's been a long day of travel for us!! This must've been the longest Monday we've ever experienced (considering it's like time traveling when we head back to the United States). We woke up bright and early to leave the hotel at 6AM to catch our bus from Matsue station for our flight to Tokyo. We met up with our friend/Chi Alpha Staff member, Shane, at Shinagawa station to say our goodbyes! Then when we got to the Narita airport and we met up with our friend Takama (from Utsunomiya Glory Church). He greeted us and gave us presents for the road! He traveled all the way from Utsunomiya and took a day off work just to hang out and get lunch with us before our flight. So sweet of him! We definitely impacted his life in some way during our stay at the church. Thank God that we're able to lift our brother's life and give him hope in God's goodness. May God continue to work in his life and bless him!! 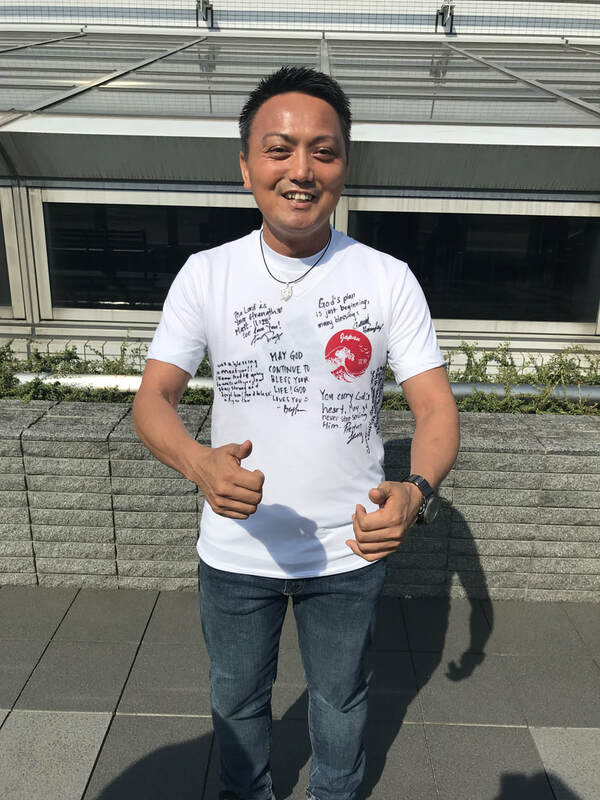 We gave him one of our DCF Japan team shirts and he had us all sign it for him. After hours of traveling, we finally arrive in San Francisco, CA! We have a few days to debrief our trip and catch up on some rest/sleep that we missed before we have to resume our regular life again. I didn't think we were able to meet/connect with so many people in our short stay in Japan, but that just showed me how great God is. He's connected us with so many brothers and sisters in Tokyo that have the same desire to love people and serve God. It was powerful being able to pray over them and bless the churches and ministries there. Some even told us that they want to visit us in California for their senior trip! Which is so exciting to see how far they're willing to travel just to reconnect and spend more time with us. My heart is so full knowing that they've received our love this past week! We hope to see our friends again in the future! Today was the last day being in Matsue, Shimane! We were feeling almost every emotion: sadness that this was the last day with the students; gratitude that we had the beautiful opportunity to not only meet the students, but also really dive in genuine friendship with each of them; homesick as we've been longing to see our friends and family at home; tired as we've been nonstop working and ministering for the past 3 weeks; and best of all, joy as we've had a fulfilling and rewarding trip in Japan. At the guys' apartment, the day began with us waking up to the humid heat and the daylight in our eyes. It's 9:00 AM and we had to take a 20 minute walk through the streets of Matsue to get to church service. For service today, Susanna prepared a personal testimony about her friend, who had committed suicide 5 years ago and how his life had impacted hers. 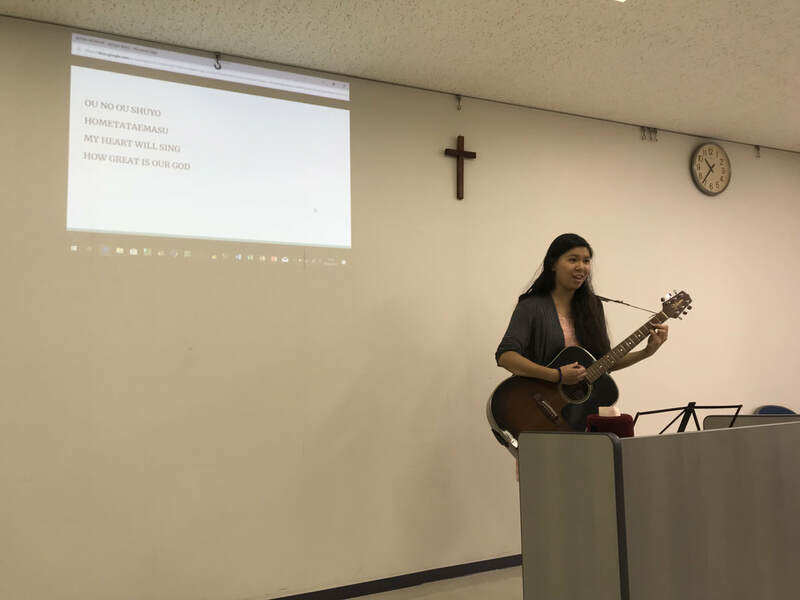 Additionally, she had led the congregation in a worship song, "How Great," all in Japanese! Since Susanna was sharing her story, many students that we've been connecting with during this week decided to come, support her, and listen to her story. I watched Susanna share her story vulnerably, openly, and courageously. In fact, she shared it all in Japanese, and though I did not understand what she was saying per se, I could feel the heaviness and depth in the atmosphere as she shared. I know the students and the church members were deeply impacted. I am so proud of her! Following service, we made our room into a lunch room and made sandwiches together! As our last meal with some of the students (like Masahiro, we miss you!!) and the church members, we all made sure we knew everybody's name and had said bye properly before we left! We also had the opportunity to pray for Kazu and Narumi! We gathered together, our team and them, and we as a team able to lay hands and share words of encouragement and love to each of them! We felt God's love overflow from us towards them, with our words and prayers. For our last day, I'm satisfied feeling full that we were able to fill the day with prayer for the Japanese people and for Japan. Through prayer, I feel like I'm able to draw more near to God's heart. "Preston. Ryan. Susanna. FAREWELL PARTY Beijo. David. Francesca." I read these words immediately as I opened the door of one of the classrooms as I walked into the party, where a bunch of students turned their heads smiling and shouting "welcome!" I felt excitement and joy bubble in my heart as I greeted and met every student there. Today was the last night being able to see these students, and I felt the rapport, the trust, and the depth of conversation I was able to build with them each. I turn and I could see sushi, tako-yaki, udon, salad, chicken, O'nigiri, and other foods all lined up, placed on tables near the door. There were drinks and a bunch of snacks on the other sides of the room, and I felt ecstatic to eat with everyone. Once we all got our food, our drinks, and our snacks, we all sat together, ate, and had our last group conversations at each table. Dialogue flowed naturally as I heard laughter and chatter all across the room. I knew people were eager to talk and share as we all were going to say good-bye soon. 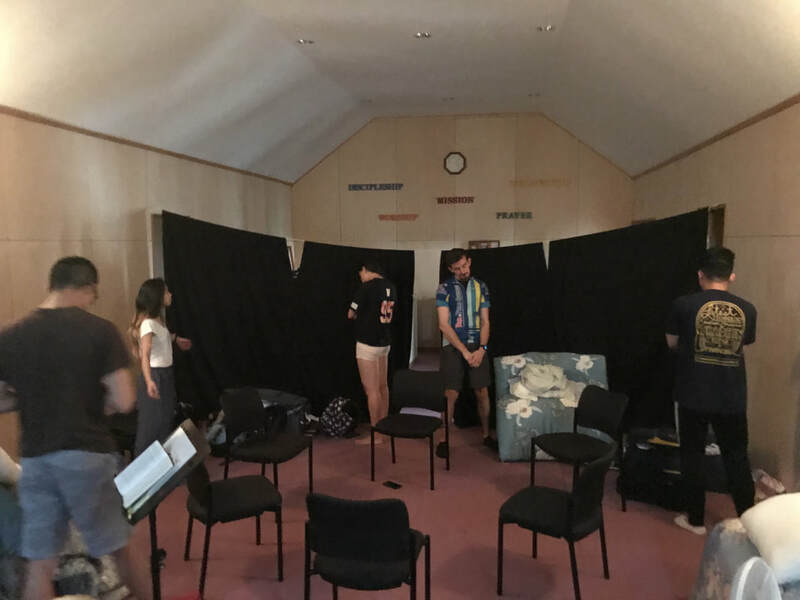 As our last time together, we played some games with each other in our individual tables, rapped together (I beatboxed), sang songs as a group (see the video! ), and got dance together as a group as well! At the end of the party, the students got together and as a gift to us... SANG A SONG, "ARIGATOU," which means "Thank You" in Japanese! This was such a sweet song to watch, listen to, and feel as they sang their good-bye and thank you to us. 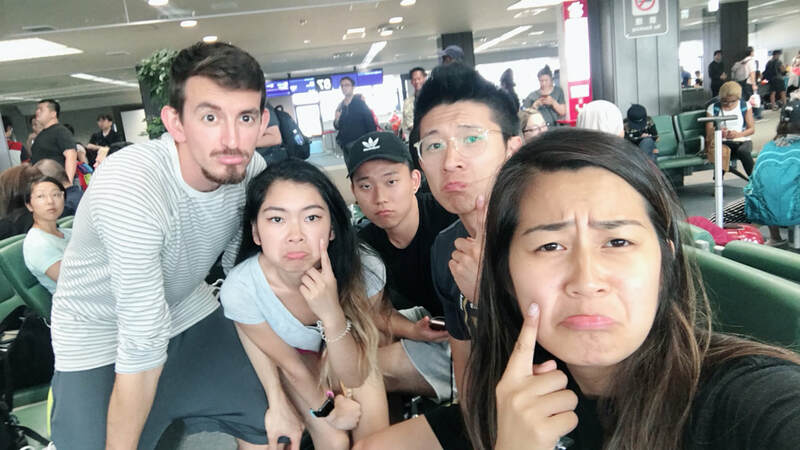 Many of our team members were crying (EVEN RYAN WAS) and at this moment, I could feel not only the weight of what we've done in Japan, but also the beauty of these precious students! God surely used us to touch these students on this trip... but more importantly, God showed us the gold and beauty of these students to begin with. God loves these students so preciously, and I was able to see a glimpse of the love God has for them on this trip. We love you Scott and Carmella, Shimane University Students, and Matsue, Shimane. Gomen Nasai (Sorry) for the late post, but here is my recap and reflection of Day 19 in Shimane!! Today, we were in for a treat as we got to tour a soy sauce (Shoyu) factory with some of the students! We were able to learn a little bit about the process of making soy sauce and even got to stir some of the HUGE basins. Watch the video to see us struggle haha. It was really interesting to learn that the factory still follows older methods like how they cap the bottles, but it was a little sad to hear that they are not sure how much longer they will be able to stay open. But for now, we really enjoyed the tour and learning so much more about soy sauce production and learned to appreciate things while we still have them. After, we went to eat some BOMB ramen for lunch before having even more 1-on-1’s with the students. Since it was ridiculously hot that day (the hottest during our time in Japan), I got some shaved ice and ice cream for my first 1-on-1. In total, I had 4 1-on-1’s with Mizuho, Hitomi, Kaho, and Akari. It was truly awesome to be able to get to know more about them, their families, and some of their future plans. Just being able to talk,laugh together, and show love, God’s love, to them was a huge blessing. I loved how open they were to share with me part of their life and wanting to know about mine and my experiences with God. Just amazing conversations and fellowship time!! Around 5, we got sushi for dinner before going to Gospel Night. Susanna led us in singing as usual, Beijo shared her amazing testimony, and we discussed her testimony with a partner. 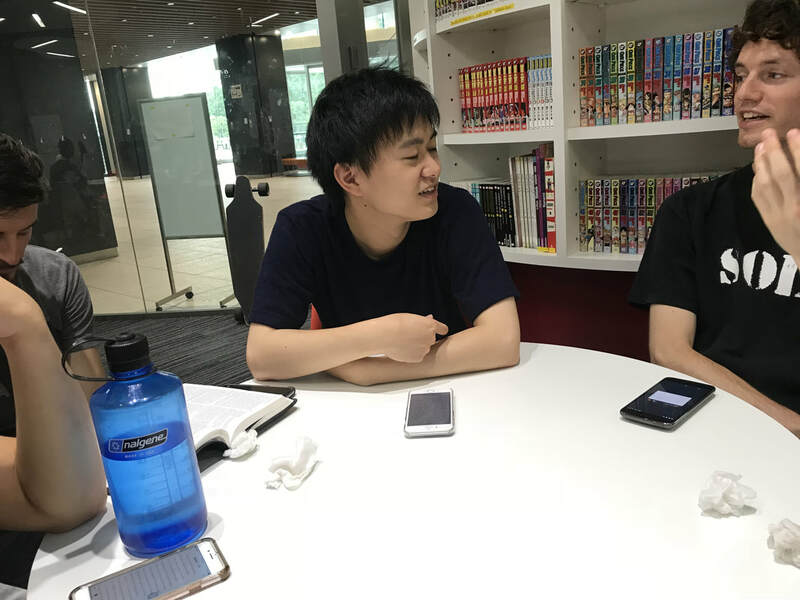 My partner was Yuto and it’s awesome to see his openness and desire to learn more about God and I was touched when he asked me to share a little about my testimony too. We also got to teach dance and do it all together after! The fun continued as we went to Karaoke!! There were almost 20 of us in total and we completely mobbed the place. It was awesome to hear the students sing and have fun without any restraints, especially Hiroki!!! I think it was a great time for all of us to release stress before finals week and relax after a busy day in the heat. Here are a few pictures from my 1-on-1's and all of us after Karaoke! Day 18!! Taco Rice!! EEHHHH!!! After a tiring yet amazing morning run with Hiroki S., a first year student at the university, the day only got better by the minute (and hotter!!) I had a wonderful 1:1 with Hiroki O. at Mister Donuts. After a great talk and bonding over donuts, I met Tomoka, Kaho, and Aika. Among chatting about past experiences and future goals, we talked about faith, struggles, and discerning our calling and what that looks like. We all agreed today that our one to ones were shorter than we would have liked, often only 30 minutes; however, 30 minutes can lead to intense questions, like “How do we pray?”, or “Why is our plan not revealed to us?” GREAT QUESTIONS!! After the 1:1's in the morning, it was time to go shopping for groceries to make TACO RICE!!! for Bible Club!!! Bible club meets in the Matsue International Community Center (MICC) from 6pm-9pm and tonight the UC Davis team was preparing dinner: taco rice which consists of steamed, rice, taco meat with corn and kidney bean, and salad. I think it’s safe to say everyone enjoyed it and many students went back for seconds. After dinner, we were led in song by the extremely talented Natsumi!! After dining and singing, it was time for sharing and Francesca shared her testimony with the group, bringing many to tears. Her story is a testimony that being Christian is all about communion and fellowship with others to create a new home when often the one we have is broken or hurting. Friends in Christ last Forever!! Today was a mix of laughter and prayer, which is a good balance to have. 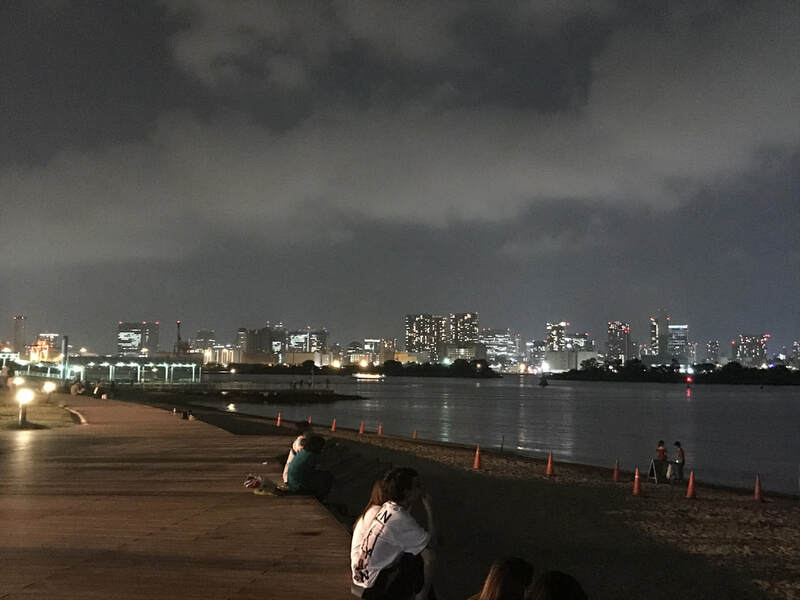 As I get to meet more students and practice my Japanese and them their English, I’m starting to realize that the Pacific Ocean is nothing more than a small lake separating our two homes. There is a love here like no other. Our friend and leader, Scott shared today about a friend that he made over the years. They were completely opposite men, in culture, thinking, and color, but the love for Christ they both shared was able to overcome these thought-to-be obstacles and are still close friends today. 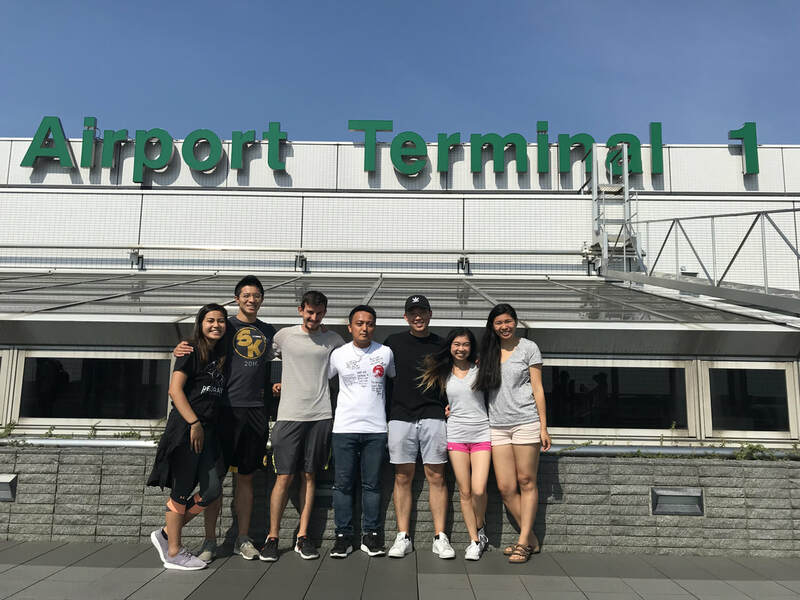 I was afraid at the start our trip that the language barrier was going to prevent me from becoming close friends with the students, but that is not even close to what is happening. Although our Japanese is poor, our kindness and desire for friendship has helped us make friends in Christ, and like I said, those last forever!! Day 17: Metcha Matcha Maji?! Hello!!! 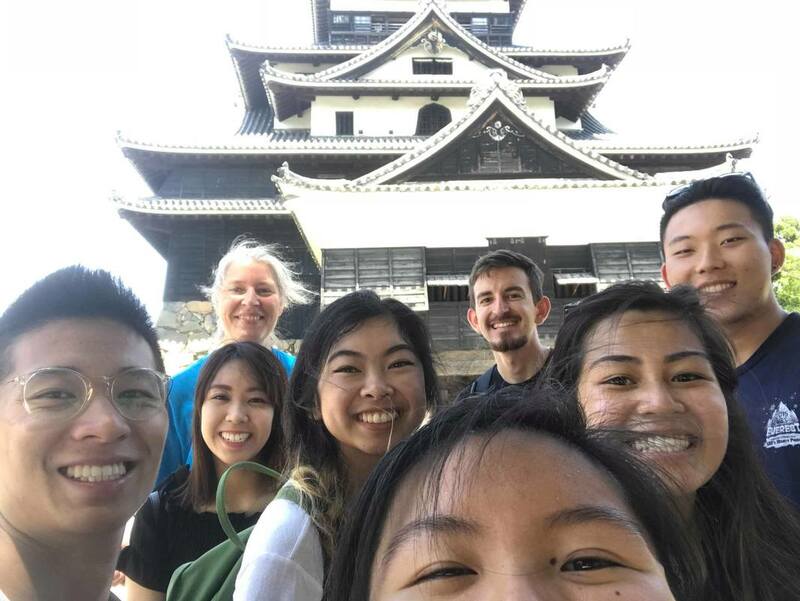 It's so crazy to think that our time in Japan is almost coming to an end, but as we near the end, each day here becomes more and more precious, especially as we have grown such strong bonds and connections with the students here at Shimane! Here is a brief video of what our day looked like!! This day has been such a huge blessing! We're here in Japan wanting to love on all the people we interact with, but we've received so much love back and I give all the glory to God for that :) He's allowed us to make connections with these students that will last long after we arrive back in California. And we're hoping that many of them will come and visit California in the near future!! ​Here's some pictures from today's one on ones, lunch, and dinner!! This is my third and last vlog for this trip, and I just wanted to thank all my fans out there for all your support!! Hehe but yaa it's been so fun getting to show you a glimpse of what we've been doing here! Let me know if you want to here more in person!! And as we still have a few more days here, all your thoughts and prayers would be much appreciated!! Love you all! Francesca, did you bring lunch? Francesca, I'm going to grab something really quick. Francesca, do you know where to go next? I've gotten a lot of laughs and a lot of questions like:"Francesca, how do you know to say that? Who taught you that?!" Hehe, I guess I just picked it up. I love connecting to the students even through small things like saying hai. It breaks the ice a little and they've voiced their appreciation for my effort in speaking Japanese! The Shimane students love sharing their culture with me and I love receiving it! but anywhere Here's a fun & short recap of today! Wow, I think I'm falling more and more in love with Japan and the people here the longer we stay in Japan. In Tokyo, I felt like my heart was brought to a greater understanding of the pace of Jesus' ministry in Japan. Praying for each university and spending time at Tokyo's central sites highlighted this country's spiritual atmosphere and also encouraged me to lift up bolder prayers to cover the ministries already working all throughout Japan. But in Shimane, I feel like my heart is experiencing Japan in a new way through the people at Shimane University. My heart delights in the conversations, the jokes, and the time we all spend together. Listening to their stories and hearing their laughter makes our ministry here more personal and I feel so much more invested in how God is moving here! I talked a little about my time with Mari and Natsumi in the vlog, but over the past week, I've gotten to know Scott and Carmella more and more too. And wow... I have so much respect for them as teachers, as leaders, as followers of Christ. In our time of having meals together, attending their classes, and checking in with them throughout the day, I've gotten to see how much they truly love their job as both teachers and missionaries. They are so invested in their students' lives and so committed to loving them well. I love their eagerness to lift their students up in prayer, in affirmation, even lifting their spirits in humor! All of the students I've met so far have voiced their love and appreciation for who Scott and Carmella are as not only their teachers but also their friends. I can see in the way that their students' eyes light up when they talk about them that Scott and Carmella hold a special place in their hearts. And even though it's only been a week, they hold a special place in my heart too. I'm so glad we got to celebrate Carmella's birthday today and bless her in prayer! The outpour of love that was so evident today reveals to me the beautiful fruit of their consistent and persistent love they have poured all over Shimane University. Carmella opens up classroom for us to have lunch the students!! 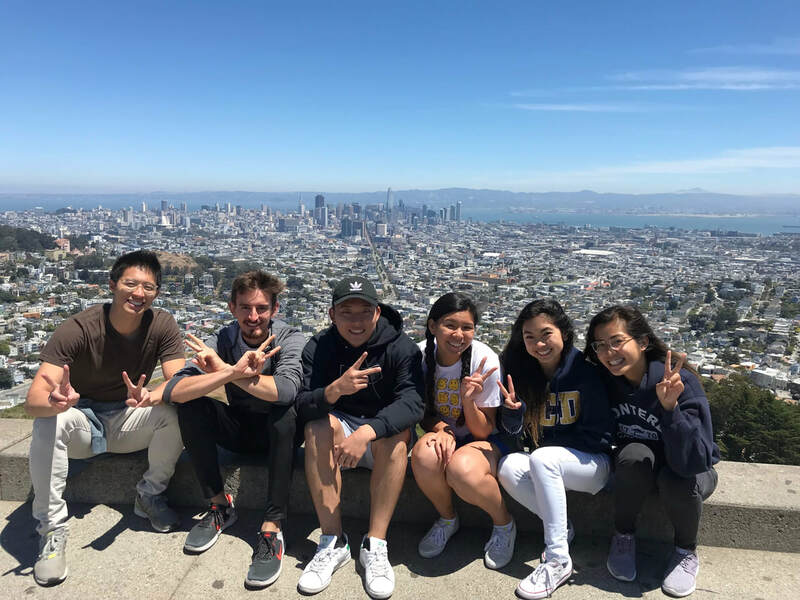 The team attended Carmella's leadership class and got to pair up with upperclass Japanese university students to have discussion about leadership. We got to share our leadership skills and how different it is from how Japanese leadership looks. This encourages the students to step out of their comfort zone and develop good leadership skills from our experience being a leader. Carmella gave us deep questions to discuss about, and it really challenges the student's critical thinking and decision making skills. For Scott's class, we formed small groups and had discussions with prompts to answer. This class is for the lower class students who are still developing their english speaking skills. We talked about what they wanted to be doing 5 years from now? Who do they want to be 5 years from now? Are they the person they wanted to be 5 years ago? These are actually pretty deep questions when you step back and think about it!! It's good to push these students to have goals and decide what they want for themselves after graduation, especially because their whole life seems to be laid out for them. They got to reevaluate how they view themselves today and whether they wanted to change in order to reach those goals they wanted. The start of one-on-ones with students!! Our team split up in mornings/mid-days to go on our one-one-one with students!! So these students sign up for 30minutes-1 hour time slots to meet up with us to have one-on-one conversations! This is where we get to talk more and get to know the students more on a personal level. It can get exhausting since some of us can gets up to 4-5 students a day!! That's a lot of conversations in one day! But it's all very enjoyable! We get to make real friendships with these students that may last a life time even when we're only visiting their University for a little more than a week. We will be inviting students out to dinner for the next few days for more fellowship if they decide to spend more time with us! Surprisingly 6 students came out with us tonight and it was tons of fun with good food and conversations. Final Thoughts Of The Day! Our team really felt the connection and bond through just talking to these students during classes and one-on-ones today! Their future goals and values gives us hope that one day they'll get to learn more about Jesus to help them get there! God's definitely setting up these students' hearts to meet him. Many of them are studying English, and have done the Florida Program (exchange program to University of Florida). This program gives the students the opportunity to experience Christianity and the American lifestyle in Florida. It's really sweet to hear them express their love for the Florida program and how much it has impacted their lives/opened up their views on Christianity. They are very curious about the bible and who Jesus is! It's nice being able to share our testimonies and show them how we are impacted by Jesus everyday! It's exciting to see where these students might end up in a few years in their faith - whether they're starting their walk or already on the path to meet Jesus! A week more of one-on-ones and bibles studies to go!! Let's go team!! Monday, July 16th, was a Japanese National Holiday, called Umi No Hi, which means "The Day of the Sea," or "Sea Day." I asked Japanese students about the significance of the holiday, but no one gave me a convincing answer to why we were celebrating the sea, other than the fact that it was tradition. However, this day simply reminded me of the fact that Japanese culture and tradition, draws heavily on its Shinto religion, as it appreciates nature and the natural world. And Monday felt like a day of deepening. Deepening my heart for Japan. I felt like we as a team were getting a taste of Japan, specifically Shimane and the city of Matsue. And quite literally, we started our morning with an appointment with a professional "Wagashi" artist. 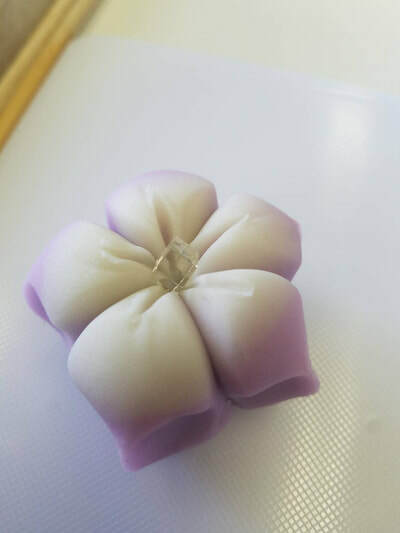 Wagashi is a traditional Japanese dessert that is often served with tea and is made of a type of mochi and red bean at the center of it. It felt exhilarating getting my hands all sticky with mochi, and at the same time, soothing getting to artistically create our desserts! Naturally, David felt the artistic flow in him and made a beautifully shaped flower as his dessert. Even the Sensei, who was teaching us, impressively complimented him! 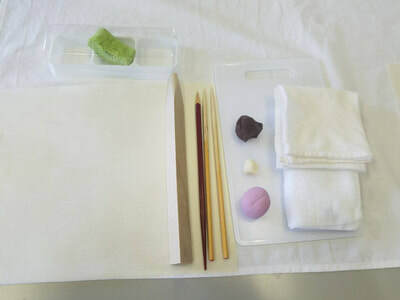 Following the Wagashi making, we as a group went to get "Dongo," which is also another Japanese kind of mochi, to eat as a snack as we then made our way to Matsue Castle! This is my third time going to the castle, but I always seem to enjoy getting to walk through the ancient door ways, look at the samurai armor, and glance at the Japanese paintings inside the castle. I feel like as I walk through the wooden floors, I get a deeper appreciation for Japan, its culture, its history, and its traditions. We stayed at the top of the floor for awhile, getting to talk with each other, silently look at the city of Matsue, and talk about the different churches around the city. Sadly, not all the churches are quite unified here in Matsue, and even though there are about 10 churches, each only having 10-20 members, they all are afraid of partnering together because of the fear of losing each other's members... We got to send our prayers towards the city and to the churches in Matsue, Shimane. I believe spiritual unity in this city is key in seeing an awakening in this place! Following the castle, we got to all eat the famous "Warigo Soba" here in Matsue. It is famous in how they prepare the Soba noodles here in Shimane, specifically originating from a city called Izumo (which is also in the Shimane prefecture). And again, I felt even more connected to the city of Matsue and the prefecture Shimane as I got to taste these famous noodles. Every bite reminded me of the growing fondness I'm having for this place. It's my third time here, but I feel like I get to experience Japan in new and deeper ways every time I come back. I hope we can come back. After lunch, we came back to pray together at the Univeristy, to intercede for the students, for the faculty and teachers, and for the city of Matsue. We were praying that God's presence would dwell in the University and that students would come to experience God's love and presence everywhere. We went through multiple buildings and floors, all while prayer walking in pairs, declaring and inviting Holy Spirit into every place we went into. I felt God giving me His heart for this city and for Japan even more as I found my heart filled with love for the students of this University. And to end the night, we along with a bunch of University students watched Sister Act 2 together! Carmella guided us in our conversations by giving us discussion questions about the movie, the characters, and the plot during key parts of the movie! Each of us had a Japanese student to partner with, and we all had insightful and engaging conversations with our partners. I found it fascinating being able to see the perspective that the Japanese student had on watching the movie that I was watching. Seeing, my partner, Kodai's responses, I felt like I was able to further learn more about how a Japanese person would think and feel. To my surprise, we both had very similar feelings, thoughts, and answers about the key parts of the movie! I felt like God was showing me today more of not only Japan and its people, but also more about how much I truly and dearly love Japan and its people. May God continue to give me His heart for this place. Today was such a treat and an absolutely amazing day. Gospel Church was awesome because of all the worship and singing and the pastor who was flowing with energy and kept us entertained and following along even though we didn't know what he was saying exactly. But the highlight of the day was our new friend and brother Kazu's Baptism Day!! 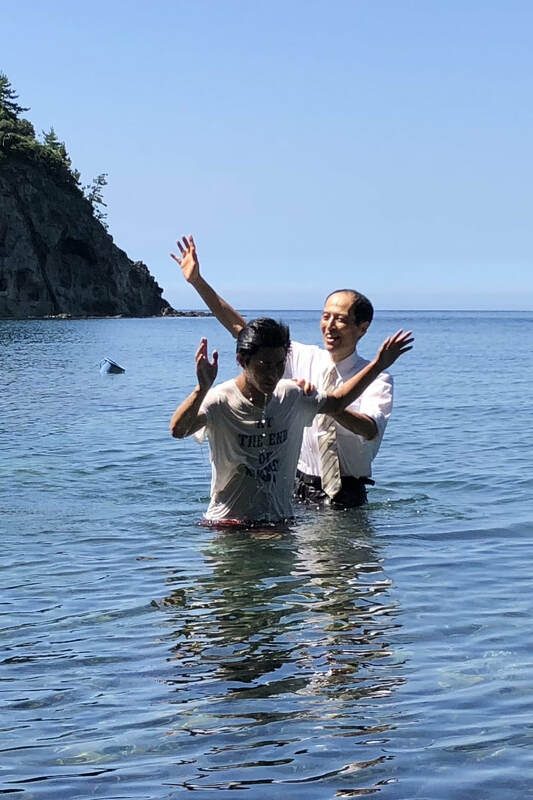 It was a blessing to have witnessed a baptism which is so rare here in Japan that the church had us go 30 min away to a gorgeous beach, had more worship/prayer, and had a small tea party with pineapples and watermelon!! Kazu's family and friends who weren't even Christian were there and were amazed by how loved Kazu is. He shared his testimony and although it was in Japanese, Susanna was able to share a little with me what it was about. 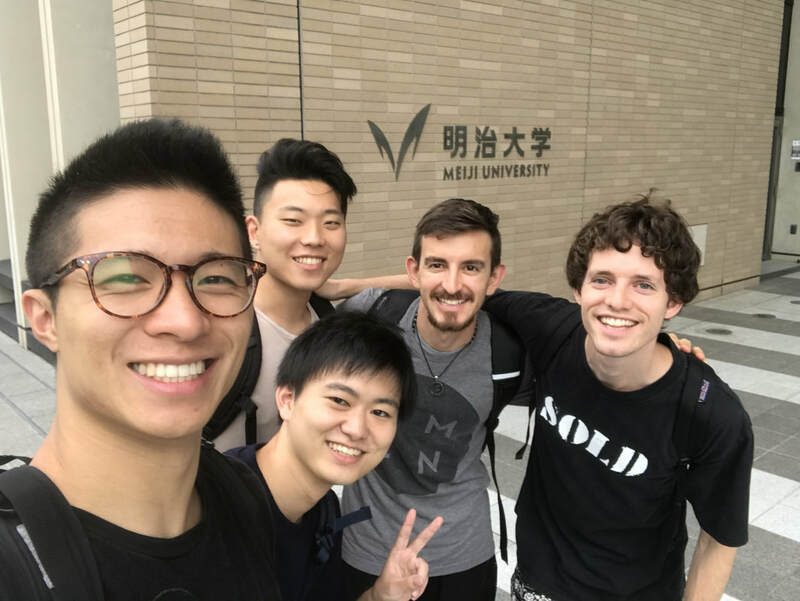 He did not grow up Christian and did not believe that he needed it and that his life was fine without it, but he was introduced to the idea through Scott and Carmella, the full-time missionaries AND full-time professors here at Shimane University, and their Bible Club. During his time at Shimane Uni, he had his bike stolen three times and he was really stressed out about it, but when he found it, he knew that God had to have some part in it. Ever since, he became curious and wanting to know more. He was surrounded by people who poured love onto him which helped lead him to the love of the Father. After his baptism, we were given time to hang out with the students and play a few games that got them out of their shells and more comfortable with us a little bit. Then we just chilled and got some food with them. Shimane is definitely more laid back than Tokyo which gives us opportunities to meet with students 1-on-1 and develop deeper relationships. I look forward to meeting them and talking about life and pouring out God's love onto them!! I can't wait to see how God will work through our team and the relationships that we make! Day 12: Goodbye Tokyo... Hello Shimane!!! Today was a bitter-sweet day. We left our great friends in Tokyo and said our good bye's, yet not even the sweet-sugar birthday cake Joyce got could over come the tears. The morning was full of good byes:( It was such an honor and blessing living with Shane for the few days we were here and I know God has a lot more planned for him in Japan. Joyce, Susan, Shane, and Beth were just the most incredible love-oriented people one could hope to meet and their testimony and legacy will be carried with us as we make our way to Shimane. At first I was(and I speak for others in the team) a bit nervous coming to Shimane. The slower pace and more layed-back life-style seemed to give us comfort in knowing we don't have to literally run out the door to catch the next train anymore. The university we will be staying at is not more than a 20 minute walk away. In addition, the added time with students will mean we get to build close relationships with the individual students. Scott and Carmela welcomed us with open arms. We are all excited to start meeting the students we have heard so much about and thankful for the opportunity to share God's word with them. Day 11: Maybe!I don't know! No Problem! Konbanwa!! Today is our last full day in Tokyo, and it's been a day full of friends, food, and fellowship! Here's my recap of today! Looking back, our time in Tokyo has been such an unforgettable and impacting experience. God has given us His heart for Japan in slightly different ways to each of us team members, and it's been really beautiful to get to share in each others differences. Spending time here has allowed me to reconfirm that God has placed Japan and its brokenness as a holy discontent in my heart and He yearns for me to partner with Him in doing something about it. Throughout this time in Tokyo, God has challenged us, grown us, and taught us many things: from having a tight packed schedule everyday to having to step out of our comfort zones and talk with Japanese college students to finally knowing how to get from the Takadanobaba station back to our home train station. It has been truly amazing to have gotten to create and build connections with the students we meet as well as the Chi Alpha staff and interns we serve alongside! 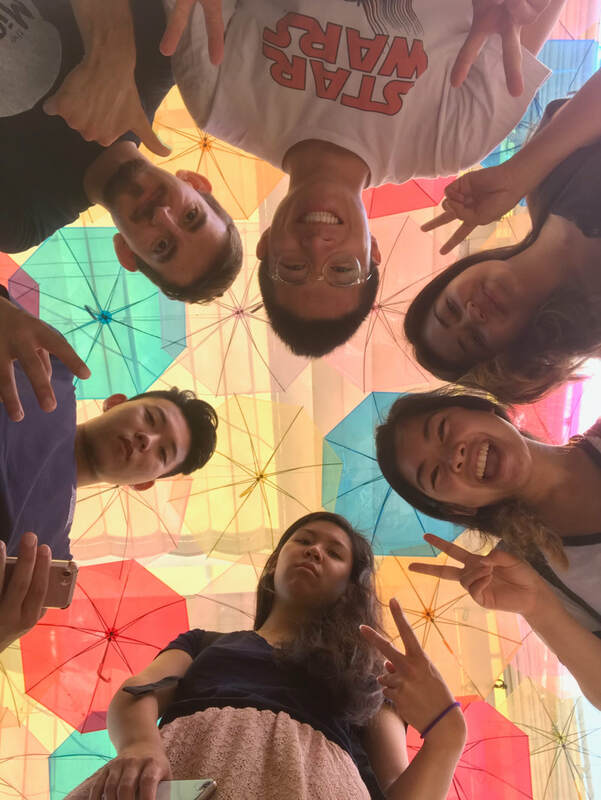 ​While connecting with the students and staff, I can also confidently say that during our time at Tokyo, we as a team have gotten closer, and I'm so thankful for that and excited for God to continue to grow these friendships! 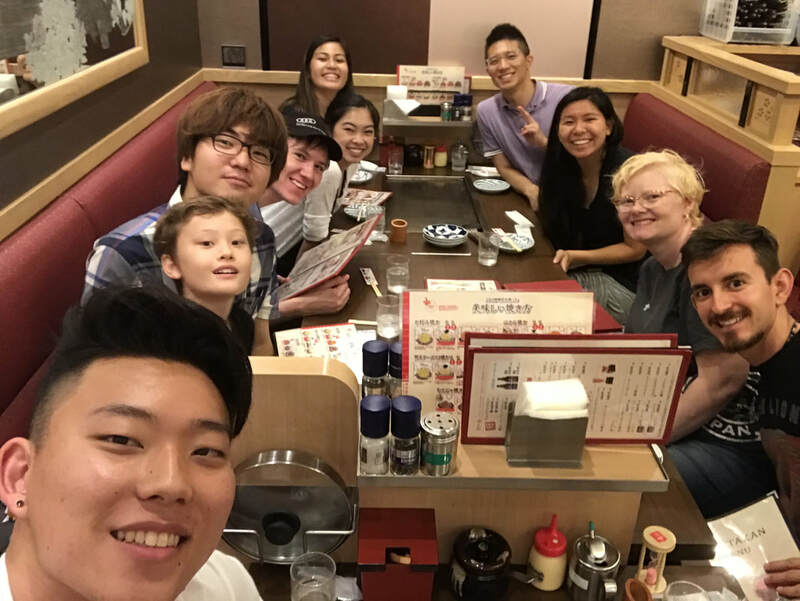 As a team, we were remembering the pastor's wife at the Utsunomiya Church we were at over the weekend (see David's blog post!) and the phrases that she would frequently say in English including "hmm...maybe!" or "Okay, no problem!" Thinking about it, I feel that God desires for us to have that heart and mindset as we go about serving on this mission trip, and everything after. There have been instances that have not gone as planned or expected during this trip. In these moments it's easy to define the success of missions based on what we've done rather than who we are, sons and daughters of the King that have been saved by grace. When our eyes and lives are fixed on the cross and what He's done for us, everything will fall into place so much more than when we focus on the action of serving and trying to make Jesus fit into our plan of ministry. God has been teaching me to be like Tomoko-sensei and to be able to face whatever comes my way with a flexible, humble, and open heart so that I can look at these and say, "Okay, no problem!" Kyusoku . eh. OISHI. SUGOI. As you can see, I've learned some more Japanese! These are probably the easiest ones for me to bring into conversation and I've found that kids get really excited when you use these phrases, so I've tried to stick to these words around the kiddos. Haha! Today, we took a break from our ministry schedule and the busyness of Tokyo to take a moment to rest! Rest has actually been a big challenge for our team because of how long our days have been. We usually leave in the morning around 8-9am and end up back at the student center around 11pm-12am but most of us aren’t able to go to bed until 2-3am because we need to either prep for tomorrow or update our blog. The other night, Susanna and Ryan stayed up until 5am trying to edit our vlog (??)!! I know I’ve been feeling the mental, emotional, and physical tiredness from our week, so it was such a blessing from Joyce to have this day off! I think I was definitely due for some rest, so I'm glad we were able to take advantage of that today! The days have been pretty long and I'm not really used to going to bed so late, so getting to sleep in more today was so good. ​​I really received the rest that Jesus offered to me today both in my individual quiet time with him and in our group time of worship. This week in Tokyo has allowed me to see Him move so intentionally in Japan but today I felt Him move so intentionally in my heart. Our prayer, worship, and team bonding time really showed me that. I felt once again His vast love for me and rest in His sweet presence. Days like this remind me just how close He is and just how sovereign He is over nations, cities, and even my physical/emotional rest. I'm ending my day holding onto this truth and going to bed excited to receive the rest He has in store for me tomorrow! And finally to conclude, here are some more pictures/gifs from today. Our DCF-Japan-Band-Cover-Album picture. Ryan inside a banana-shaped kids play structure. Preston inside a banana-shaped kids play structure. Our team in front of some pretty lights. OYASUMI! (goodnight!) Hope you enjoyed my update! Love you all! Asakusa, famous for the Sensō-ji (a Buddhist temple). Our team got to do a quick prayerwalk in the shrine and got to witness the large amount of people coming to these shrines to pray and hope for luck and prosperity. I explained more of how I was feeling throughout the walk in the Vlog. Our team has felt a wide range of emotions, but prayed for strong hearts and confident in going through the Shrine without having to be affected negatively! God is good, and he loves us! David once again got to share his touching testimony of an intimate time God's touch him through his love for his sister. Sharing how he's overcome a time when he felt like he couldn't get over the storm. But God's here through the whispers of the night and whenever we decide to listen to him. The guys - Preston, Ryan, David, and Shane, met up with a student named Keisuke and had bible study at the lounge. Even thought I wasn't there to witness their conversations and hang out, through our debrief I heard that he was really interested and asking questions about the bible. He wanted answers for the "essentials of being Christian". Such as how to pray or why Jesus doesn't reveal his plans for us. "Life with God is like walking on a hike, not told of where the end point is, but God tells us to walk with him each step of the way"
Another thing they got to share with him is where each person stands in their faith. They used this image of a swimming pool with people in it and around it. The water is God. Everyone's at a different stage of knowing him. I think that this really encourages people like Keisuke who is exploring his faith to understand it better from our own experiences. This was a ladies' bible study! Thankful to have Yuhee-Sensei help us get a room to meet at this university. Susanna got to tell her testimony of God's plans for her when things don't go the way she expected. We got to discuss about God's calling and his plans for us. It's half way through our trip please pray for rest and energy!! Keep praying for Japan! It's my 3rd time being in Tokyo with Chi Alpha Japan, and I'm grateful to be able to come back again to visit Utsunomiya Glory Church and Sonrise Nozomi Church in the past few days. I've found myself really enjoying and cherishing every moment with the church members and pastors. We spend hours hanging with them, eating with them, and praying for them. But today was a day dedicated to serving and reaching the university students. We spent the whole day praying & interceding for Japan and connecting with students and the Chi Alpha interns/staff during outreach and Bible study. To start, we went to pray in the Yamanote line, which is a train line that goes around the heart of Tokyo in about 1 hour! So we along with other ministers and missionaries came together for an intercession over the city of Tokyo. I've been learning in these times in Japan about the power of intercession and prayer, especially in a city where Christianity hasn't been firmly established. Intercession brings us to the heart of God and to His greater plan for the world. We just need to join in His ministry. At the University of Tokyo, we as a team went to two different campuses. 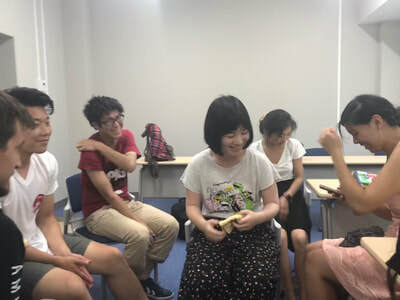 Francesca and David went to the Hongo campus to do a Bible study, where Francesca got to share her testimony and a few discussion questions on a Bible passage with a few Japanese university students. Ryan, Beijo, Susanna, and I got to go to the Komaba campus to do another Bible Study. Susanna and I randomly met a Japanese student on campus and actually brought him to Bible study! I thought that was a highlight because normally students aren't open to go to a random bible study with strangers, but he seemed open to hear and learn! After dancing, Beijo shared her testimony about how God met her with unconditional love and led us in a bible study about God's love! Following, we went to Waseda University, a highly ranked Japanese University, where we all paired up and tried striking up conversations with students across the campus. 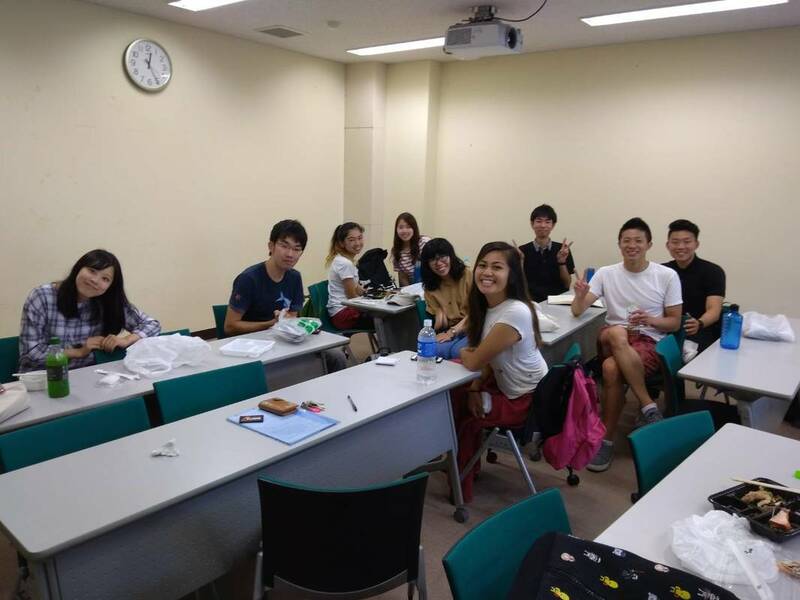 Francesca and I surprisingly met a few students who were utterly fluent in Japanese and English! We met Arisa, who lived in Houston for 6 years and studied abroad in Seattle. We were aiming to make friends in the university, connect with them, and even invite them out to the Chi Alpha Live event this Friday! This process of talking to strangers, who would most often reject your desire for connection, can be very discouraging, but I'm still trying to focus on not just the fruit, but simply being obedient to what God is doing here in Japan. I've been learning the power of staying and resting in Him while doing ministry with Jesus. Continue to be praying for us!!! Hey guys!! Excuse my awkwardness and lame jokes in the video haha. The past few days were awesome, especially the past weekend where we went to Utsonomiya. Tomoko Sensei, Kayoko San, and Wataru Sensei were all so loving and welcoming that I felt like I was at home. I loved the English kids camp and the Sunday morning church service. We were able to pray for them and our new friend Takama. While praying I got a image of him that resonated with him and seemed to fit his situation perfectly, which surprised even me. I've been praying that the Holy Spirit really speak through me and it's amazing how prayer has been answered and continues to be answered. Utsonomiya was really a special place filled with love. Today we got the opportunity to serve at Nozomi Sunrise Church in their children's school and led their services. We played with the kids and even taught them a simple dance that got even the teachers jumping around!! It's awesome to see God's precious little children jumping around with joy! As the next director of Agape, seeing dance being used as a form of worship is that much more amazing to witness. The first service was smaller with a few moms and we got to share a little about our team and CA, sing songs led by Susanna, and listen to David's testimony. The second service was bigger and we got to listen to Susanna's testimony and a message from Francesca. We talked to the people after and some of them told me how the messages they heard today resonated with them. I got the opportunity to pray for a few people and two people were highlighted to me. Chie and her son Hiro are going through a rough time with their family and we were able to pray for them. I saw how strong and brave they were despite this struggle, and especially how loving Hiro is towards his mom. I will definitely be keeping those two in my prayers. Another amazing part was when Mikami Sensei treated us out to some sweet potato ice cream while touring downtown and looking at various Japanese cultural shops and cafes, even a Japanese Starbuck!! Although today was tiring, the people I was able to encounter really gave me the energy to keep going and reminded me of why I am here. Nozomi means HOPE and after visiting Sunrise Church, I have gained hope that God will move even more powerfully going forward! This weekend was filled with great laugher and joy but also sorrow. We traveled 2 hours on train to Utsunomiya and we warmly received by Tomoko sensei, Wataru sensei, and Kayoko. After a short orientation and a few happy tears, we were introduced to a classroom of happy and energetic kids and had a whole day of play and fun. We enjoyed nagashi soumen which was a special treat for the kids and ourselves and played many games inside as well. The whole evening was simply full of energy, love, laughter, and fun. It was a reminder to for me that God loves every one of his children and calls us into his fatherly embrace. Watching the smiles on the kids’ faces gave our whole team affirmation that we were ministering not only to kids but to the families of those children as well. After a long day of playing we were able to enjoy a gracious dinner by our friends from Utsunomyia church and even enjoy an evening at the Super Sento public bath house. Though uneasy at first, I let the hot water and steam take away some of my own steam and stress away. Japanese culture is very different in this regard but I was pleasantly surprised at the community and respect that I experienced; no one was seen as higher or lower, naked, everyone is the same. Back at the Student Center, we hosted the Chi Alpha Live, which is like a large group filled with activities! 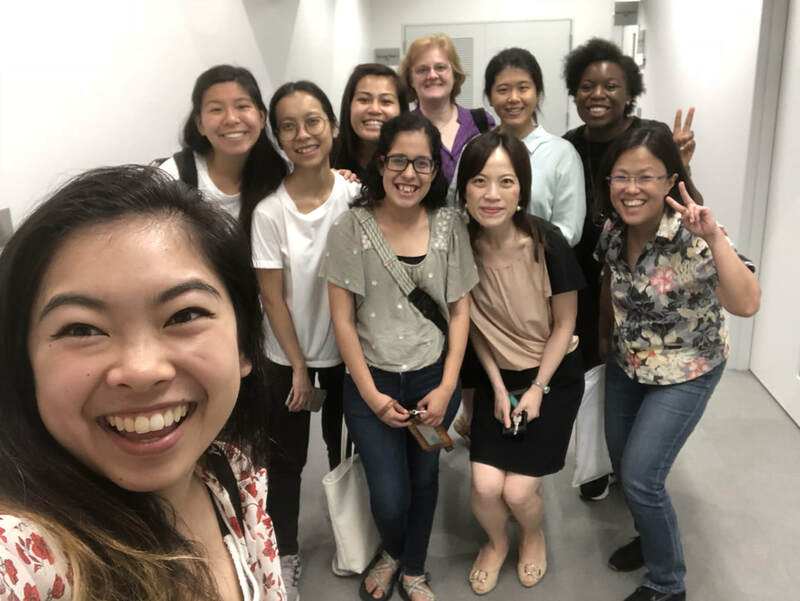 The center was PACKED with people coming from such different backgrounds- Chi Alpha interns, Singaporean missionaries, international students, and local Japanese students! As the DCF team we got the privilege to host the July 4th special Live with providing some Sloppy Joes, funs ice breaker games, dancing, worship, and Beijo's beautiful testimony of how she met God in college and how His unconditional love set her free! Today has been such an amazing day. The fact that we were able to talk with people who live on the opposite side of the world in such a different culture was absolutely mindblowing. Even though it's just been one day, we have been able to be a part of these people's lives, and I truly believe these relationships will continue to grow and that God can use our relationships with them to show them His unconditional love. So how is this all making me feel looking back, experiencing now, and looking forward? Konnichiwa! Sumimasen! Itadakimasu! Arigatou gozaimasu! Hello! Sorry! Let's eat! Thank you! Today was a first full day in Tokyo and I fit right in with the natives using these phrases haha! These are the words I probably used the most today with "sumimasen" being my #1 go-to word! It's crazy how many people are walking around Tokyo and how many times you accidentally bump into them. Today was our orientation day! We started the morning with an orientation presentation at the Assemblies of God headquarters with Joyce, the Japan Chi Alpha director, and Susan, one of the staff members. It was so sweet meeting them and getting to hear their heart for Japan and the students at the universities. They're so genuine and so hopeful for God's presence in Japan! It was inspiring to see their hearts break but also burn for the students. I'm looking forward to spending the next couple of days following their lead in reaching the campuses. We spent the rest of the day orienting ourselves to Japanese culture with Masaki, our bubbly and energetic tour guide! Our past DCF teams have gotten to know Masaki really well in the last two years so when he saw Preston, he greeted him with a huge smile and a huge bro hug! He said that the DCF team is one of his favorite teams that comes to visit in the summer (so sweet!). And his openness and vulnerability was so refreshing! We got to hear his whole testimony of connecting with Joyce and the other Chi Alpha Japan staff members in the middle of a packed train car! He introduced us to Beth and her son, Kazu, and they took us to go sightseeing and get connected with the cities we'll be visiting for the next week. 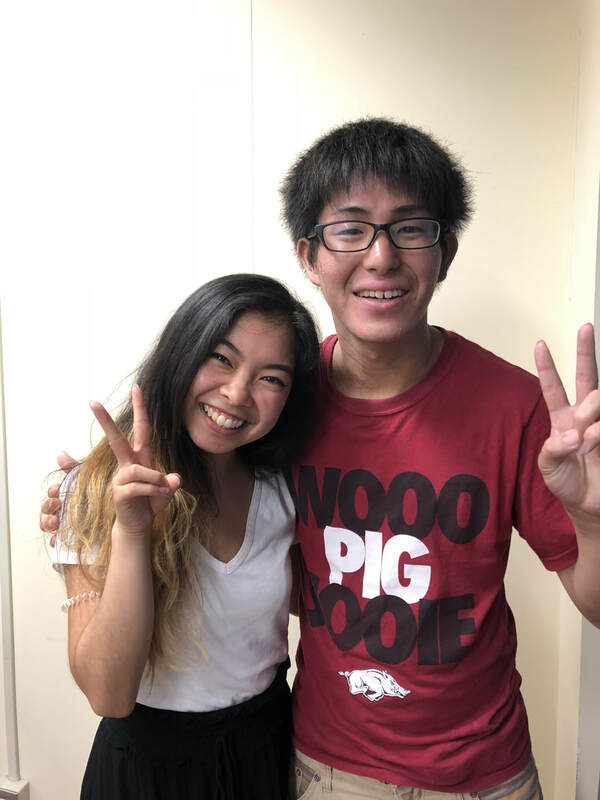 Beth and her husband had previously worked as Chi Alpha staff members in the states and when they moved to Japan with Kazu in February, they got connected to Joyce through Chi Alpha. It's cool to see relationships being made not just in college campuses through Chi Alpha but also across countries! 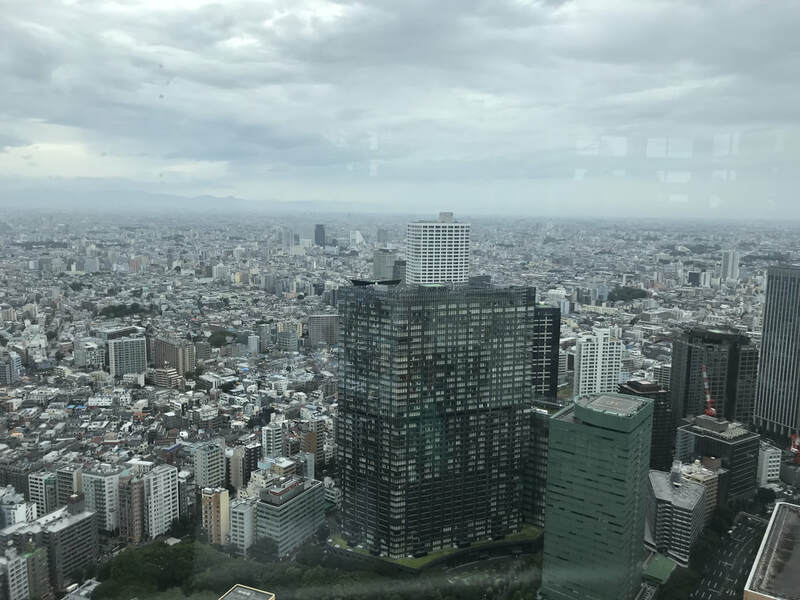 The view from the Metropolitan government building! WOW! And finally, we made our way back to the Chi Alpha Student Center. The team split up with the guys joining Shane, one of the Chi Alpha staff members, to basketball club where they got to meet and play with some university students and the girls staying back to prep for our big day tomorrow XA live event! Beijo and I finished up writing our testimonies while Susanna practiced her songs for worship. It'll be our first event with all the XA staff and students, we'll be sharing these testimonies, leading worship, and getting to know the Japanese students more personally! We're excited but definitely a little tired from our long day today. Today, we got to settle in and explore Japanese culture, but tomorrow will be our day long adventure into hands-on ministry! Today was a beautiful day! I really felt the team bonding and connecting with our new friends as a unit! Whether it was speed walking to get on the same train car or practicing our Japanese with the locals, we were all enjoying one another and taking in all that Japan has for us. I think this trip will have a lot of fruit not just in our ministry but in our intra-team friendships as well! My highlight for today was definitely going to the AG headquarters and meeting Joyce! She's been in Japan for the past 27 years and her heart for Japan continues to grow bigger and bigger each year. I felt really connected to her hopeful and expectant energy! Knowing that Japan is dominated by Shintoist and Buddhist religion, I was anticipating to see high burnout among the missionaries. But, I was wonderfully corrected by Joyce's beautifully bright perspective. Her heart is so pure and so alive! It's an honor to follow her lead in meeting these students of Japan and I'm looking forward to updating you all on our partnership with her! Day 1&2: We have arrived in Japan! Each team member will be blogging/vlogging! Stay Tuned for our posts!